Does anybody have any english translations of the following korean words and phrases? 불만 (Pul-man) John F. Unsatisfactory; dissatisfied. Not specially a go term. 백의 수순 (Paek-ui su-sun) White's ???. Not in my dictionary. 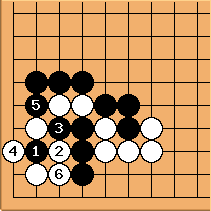 Korean Go Terms page says su-sun is a move that makes a previous bad move good, however, seeing it used in context in the Korean go book I own, it looks like it's an exchange of moves, a way of playing, or a move order. This would accord with the previous term. John F. This susun is the same as Japanese tejun, which I see has a page on SL but not a very accurate one. 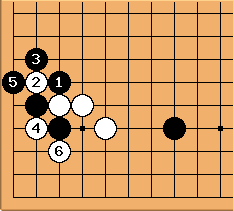 The usual way to grasp the usage of tejun/susun is to supply the word 'right' (here: right order of moves for White). 호조 (Ho-jo) Favourable, satisfactory, "everything is fine"
두텁다 / 두터움 (Tu-t'eop-da / Tu-ta-um) Thick, thickness. John F. W is thick(er). Alex Weldon: Heh. Talk about ambiguity. My dictionary gives two definitions: 1) be put to shame/humiliated, 2) be superior/dominant. Obviously, here it's the second definition. John F. 1. Nerai/aim. 2. Cramped 3. Humiliating/painful. You'll find it a lot easier to get help if you give us some sort of context. Is the book you're reading a state secret? deg Book: ISBN 89-7067-156-0 Context: The context is 'Black/White <insert word>' as the title to a diagram. e.g see above. If the diagrams would be useful I'll put them in. There's more (hangul) text with the diagram too. Finding the correct symbol is a laborious process on my system, so I'm reluctant to list this text. John F. Aha - joseki book by Seo Neung-uk. If you have a recent GoGoD you can look up hangeul easily and copy and paste the html version here. deg I have a recent copy of GoGoD (and a machine that runs MS Windows). I was able to make korean characters appear in a green box using the dictionary program, but could only save the characters as .bmp files. Although I selected an html option, I don't know what that did. John F. Once you've got the characters in the green box and the html option ticked, do Ctrl+Alt+rightclick anywhere on the green box and the codes shown in the resulting message box will be on the clipboard (ignore the underlining in the message; it comes out right once you paste somewhere). Of course this works for characters and kana, too. 후속수단 (Hu-sok su-dan): 후속: following, succeeding 수단: a means, a method, a measure. 후속수단 literally means "a following measure (move)". It most often means "a move strategically complementing the previous move(s)" and sometimes "a following measure to finish or make the best out of a situation created by the previous move(s)." 수습 (Su-seup): coping with, making the best out of, saving. It means "managing orderly a chaotic situation" or"taking care of a bad situation." 호조 (Ho-jo): a favorable turn, a favorable trend. It is often used to denote "a series of good moves setting a favorable momentum." 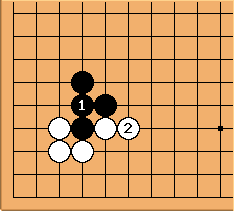 두텁다 / 두터움: thick, of positional advantage. However, it sometimes describes "solid defensive moves to maintain superiority and conclude a winning game." 노림 (No-rim): a noun form of 노린다 literally meaning "(look and) aim intensely." However, it often denotes "hidden agenda behind a move" and "actual benefit of a move." 노림수 is a move with hidden agenda. 옹색 (Ong-saek): worse off, embarrassingly unsatisfactory, (depending context, it could mean "of poverty"). It illustrates "reaping little return from your investment" or "a situation wherein your stones are alive without influence or material gain (hence, living embarrassingly in poverty :o)." In particular, I'm trying to figure out the word "편함" in context. John F. I suggest "White settles himself easily." nachtrabe: The book is "Haengma," ISBN 89-333-0346-4. Any help is appreciated! Alex Weldon: It must be "Bad shape for Black," since the caption says Black, "u" shape. I looked u up in my dictionary to verify, however, and it seems to be a positive thing, meaning "fine, excellent, superior." That can't be right, since Black's shape is clearly bad in the diagram. Perhaps u-hyeong doesn't mean the same thing as u and hyeong as individual words. Maybe John F. knows? John F. This one means "stupid shape" (gukei in Japanese). Once translations have been found, those entries could be put into Korean go terms if appropriate. Alex Weldon: As a gesture of goodwill, I have changed my romanisations on this page to what I believe is the system John F. is suggesting. 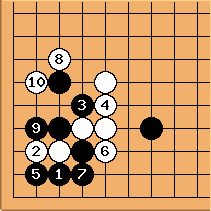 There is also the Baduk Terminology PDF, translating korean baduk terms, book titles and player names.